By admin at May. 9. 2007. There are more than 2500 cultivars of hostas available to the gardener. They range from the tiny to the immense. The smallest I could find with a cursory search was ‘Illicit affair’ (described as a “tiny temptress”) that grows to a height of 3 inches with a spread of 10 inches. I think that the one Esther grows is smaller than this but we do not know what it is. Two of the biggest happen to be growing in my shade garden, Blue Mammoth which reaches 30 inches with a spread of 70 inches and ‘Sum and Substance’, which grows to 33 inches with a whopping spread of 80 inches. Mostly hostas are grown for their leaf color and if you are going to grow the more exotic ones there are things that it is useful to know about the colors. The blue hostas are not really blue but have a wax coating on the leaf. Too much heat or sun will destroy the coating and the leaf will appear as its normal green color. Blue hostas are also slow growers. Hostas are chameleons; their color will often change for various reasons. This is why your hosta may not resemble the plant you thought you bought. Viridescence is the process by which a host will start out a light color and change to green as the season progresses. Two hostas “’White Wall Tires’ and ‘Mountain Mist’ start out as totally white. It this condition persisted they would die, as green chlorophyll is necessary for photosynthesis. As the season progresses that develop chlorophyll and turn green. 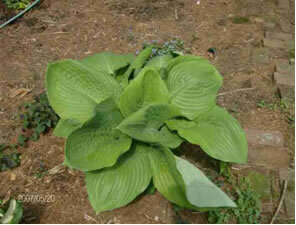 The spring colors of many gold hostas will fade into green as well. Lutescent hostas will come up green in the spring and, as the season progresses, turn to gold. ‘Gold Standard’ is a well known lutescent hosta. Completely green as it emerges, the centers of the leaf fade to gold while the margins retain the dark green color. Gold hostas do best with more sun. While the ideal for hostas is probably morning sun, many of them will prosper in brighter situations and their colors will be better. The golds tend to deepen to chartreuse without adequate light. The greens will bleach out if given too much sun. As already stated the blues will lose their blue tint unless grown in the shade. In albescent hostas yellow colored leaves becomes whiter as the season progresses. ‘Remember Me’ is an example of an albescent hosta. It is one that changes so dramatically from a green bordered gold hosta to an ivory or white centered leaf that it is barely recognizable as the same plant by mid summer. If you think that your hostas are not the colors that you think they should be the first step is to find out if you have a hosta that changes color normally as the season progresses. It this is not the case try moving it to a brighter or a shadier location. Remember brighter light for lighter hostas and less light for the darker ones. My Sum and Substance at 3 years old.